For busy executives who go back to school, the greatest challenge can sometimes be just getting to class. It’s something restaurateur Miguel Pires knows well. Pires launched two spots in his hometown of Manassas, Va. — Monza and Zandra’s Taqueria — and has started working as a real-estate agent for Weber Rector. At 31, he is one of the youngest students in the five-week Real Estate Seminar Series through the Executive Education certification programs at George Mason’s School of Business. Flexibility is the name of the game, and universities around the region are introducing programs that cater to the limited time executives have to acquire knowledge. Johns Hopkins University is introducing a master’s in Global Public Policy that will let students complete coursework by gathering every other week for a Friday and Saturday for 16 months. The Brookings Institution offers a Master of Science in Leadership that can be completed in as few as three years, or as many as 11. The GMU program Pires is in meets just once a week for a full-day crash course on graduate-level topics that typically require a semester to teach. If students miss a meeting, they can make it up the next semester. “This is a perfect way for me to start my [real-estate] journey, without having to commit to a two-year program,” Pires says. Pires heard about the program through his boss, Coleman Rector, an instructor and one of its co-founders. It was designed for students who cannot make time for a master’s program, Rector says. The series costs $2,975 (a fee employers may cover), and they gain the business know-how to work in real estate or start their own venture. Students in the Brookings program apply what they learn immediately — it’s a course requirement. At the end of each of the 22 courses, students submit a paper explaining how they used what they learned at work. Most work in the federal or state governments and have a federal GS level of 13 or above, generally executives in their late 30s and older. Most of the two-day courses are based at the Brookings offices in Dupont Circle, but students go to St. Louis for a few residential courses at Washington University in St. Louis, which accredits the program. Students have the option of taking a course here and there, or working toward the degree at their own pace. “It’s a unique program. There’s no sequence, per se, but the courses fit together like a jigsaw puzzle,” says Jackson Nickerson, the program’s associate dean and director. The Global Public Policy degree at Johns Hopkins’ School of Advanced International Studies (SAIS) has a similar structure. The program that will launch next fall is a bit like an M.B.A. rethought for the international relations arena. Classes will focus on real-world applications, and a weeklong capstone abroad will help students simulate what it’s like to work as an international consultant. Meeting just twice a week will help the program draw students who work full time and have at least seven years of work experience, but that won’t compromise the material being covered, according to Associate Dean Melissa Trotta. “We’ve made sure it is a rigorous degree. This is not ‘SAIS light’ in any way,” Trotta says. Ray Morris, deputy executive director of the Regional Planning Commission of Greater Birmingham in Alabama, was one of Brookings Institution’s first graduate students in 2010. He’ll also be one of the first to graduate with its Master’s of Science in Leadership this month. The 40-year-old Alabama native already holds a master’s degree and Ph.D., but he said the Brookings program was appealing for its practical application. “This is the way grad school is supposed to be,” Morris says. Courses focus on fostering leadership and thinking skills, rather than on nuts-and-bolts concepts that a typical M.B.A. may cover. One class helped Morris find a way to resolve a years-old impasse with a county in his region. They had a database he wanted, but rather than take “no” for an answer, he built his own database and invited the county to participate in it. “It worked like a charm, and I never would have thought of it,” Morris says. A group of local real estate executives is setting up an education program for local real estate professionals who want additional education but are not necessarily ready to commit to a full degree. The organization, called the Institute of Real Estate Executive Education, will offer a series of five full-day seminars on topics such as finance, development and leasing. Dave Sislen, one of the program’s founders and president of Bristol Capital Corp., said he and his partners saw a gap in the market for 28- to 35-year-olds. Many real estate professionals want to further their education beyond industry panels but can’t afford the money or time for a full university program, he said. Sislen and four other local adjunct professors and entrepreneurs have poured $25,000 into establishing the program, renting space at 1331 G St. NW and putting together a curriculum. The institute charges $495 per six-hour course or $1,895 for an entire program. The program is not accredited, though the founders are working to get it approved for continuing education credits by professional groups such as the American Institute of Architects. Students who complete the full series do receive a certificate of completion. The first five-week session begins Sept. 16. The program’s instructors have backgrounds in development, marketing, finance and leasing. They have taught at universities such as Georgetown, Virginia Tech, George Mason and the Harvard School of Design. One of the teachers is Marnie Abramson, a former principal at the Rockville-based Tower Cos., who recently took a break from her family’s company to work on her own ventures. After Abramson left the company in February to focus on two main interests — education and green technology — she and Sislen started talking about viability of a program like the institute. She says the institute, dubbed the RE3 Institute, is a hybrid between university education and normal industry training. As the seminars continue throughout the year, the team hopes to use the program to build a Facebook-style network of industry professionals. The group has approached local universities with its overall concept but has not been able to form a partnership, Sislen said. ROCKVILLE, Md., Aug. 23, 2011 /PRNewswire/ -- Graduate Practitioner Faculty members from leading area universities; Mark Hassinger, Coleman Rector and David Sislen; and real estate developer/entrepreneur Marnie Abramson have partnered to create the Institute of Real Estate Executive Education (RE3 Institute) which is launching its Fall Seminar Series in mid-September. Principal Dave Sislen explains, "Real estate professionals today face complexities associated with municipal approvals, design, construction, and finance that simply didn't exist 30 years ago. 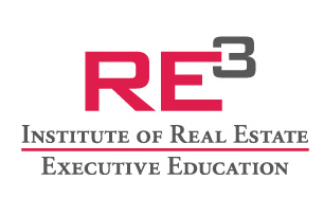 RE3 provides many of the same technical and analytical skills as those taught in leading graduate real estate programs around the country but does so in a more focused and cost effective manner." Messrs Sislen, Hassinger and Rector have more than 30 years of combined experience as adjunct professors who have taught and lectured at the following institutions: Johns Hopkins University, George Mason University, Georgetown University, Virginia Tech University, Clemson University, Harvard School of Design, NAIOP, and ULI. Ms. Abramson is a graduate of Johns Hopkins University Masters in Real Estate Program, "There is a lot of value in creating an educational product that extends beyond the reach of well-established, well-managed programs. This economic downturn provided a lot of executives their first opportunity for workouts, municipal defaults, and more. Our Fall Seminar Series offers intensive learning sessions covering only the most relevant information; enabling The RE3 Institute to position executives for success in any market." Courses offered for the Fall Seminar Series begin on September 16th and include: Real Estate Enterprise, Real Estate Finance, Managing the Development Process, Real Estate Entrepreneurship, and Current Case Studies. RE3 Institute is an AIA Preferred Provider of Continuing Education.